Well-behaved canines like Autzen are welcome to roam the office as they please. Twice-daily walks by hired walkers punctuate his lazy days of chair warming. Because the office’s 100 humans need snacks too, the bar area is stocked with people treats like turkey jerky and popcorn. 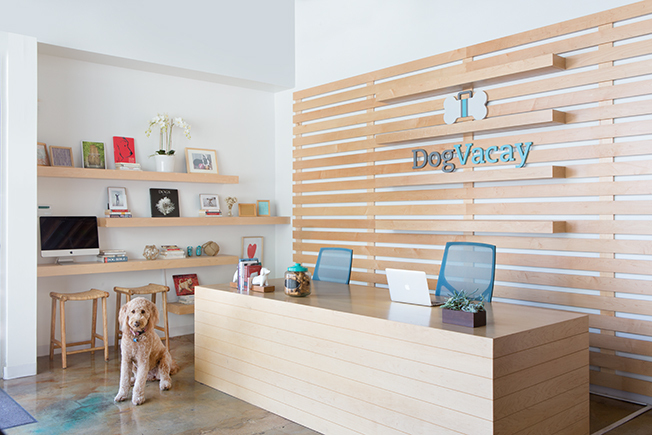 Buttersworth welcomes visitors—and lots of interviewees these days—in DogVacay’s reception area.